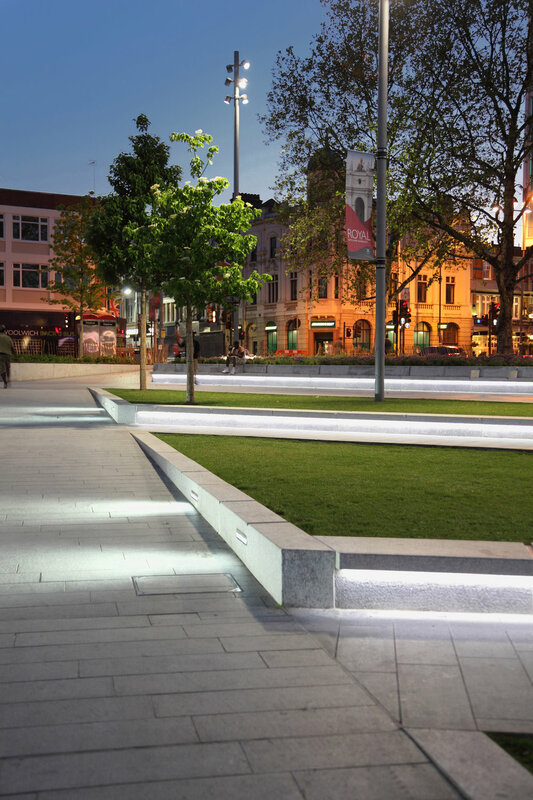 Envisaged as part of the wider Woolwich masterplan, the Royal Borough of Greenwich set out key objectives to create a fully accessible public space for all, with feature lighting, soft landscaping and a water feature that could drain to accommodate events. The practice saw off almost 40 rivals from across the world to win the contract, with the work completing in 2011. Gustafson Porter + Bowman’s design is based on the concept that each square embodies an essential quality of Woolwich, whether historic or natural, and seeks to create spaces that are particular to Woolwich. The design used pedestrian movement studies to identify key routes through the town centre, and developed these to create distinctive quality public spaces that both enhance the experience of the pedestrian and respond to their needs. Terracing is utilised to improve the usability of the steeply sloping squares, with level routes provided throughout to ensure accessibility for all users. A language of materials and details was developed that incorporated the best practice for seating, ramps, lighting and planting. Natural stone was chosen for its robustness and appearance, and its colours tied into the palette of the wider town centre. The robust detailing of the design has allowed the spaces to be well maintained by the council. While the language of the project is modern, the design is sensitive to the historic fabric of Woolwich, especially its Grade II listed buildings which overlook each square which are re-established as key architectural features in the public realm. The soft landscaping addresses the shortage of green space by creating a ‘Garden’ that generates a sense of calm and relaxation while providing a functional space that can be transformed for other uses. Reasserting the importance of open and inclusive space, General Gordon Square illuminates the role of urban public places in establishing notions of normality and developing a sense of belonging, and provides a live example of convivial culture, in which we live together with all our ordinary differences. A film by Esther Johnson · 2015 'Alone Together, the Social Life of Benches' illuminates the thoughts and memories of frequent users of two public spaces in London: General Gordon Square, Woolwich and St Helier Open Space, Sutton.